When there are public holidays, we usually meet up at our or my mothers house for a nice and quiet family lunch. 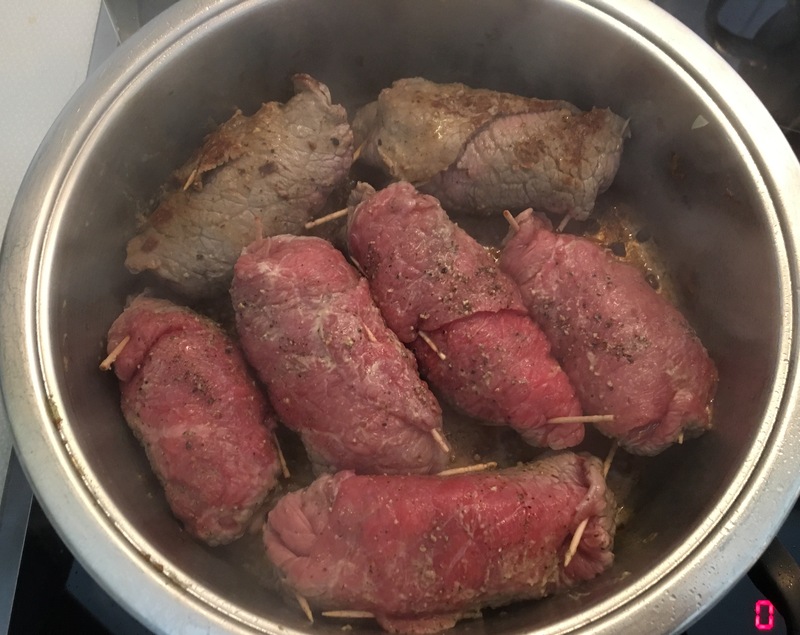 On Easter we typically make beef roulades because it is a tasty way to use some of the many cooked and colored eggs you typically receive during this time. It is also a bit on the time-consuming side and not really suited for a fast mid-week dinner. The roulades for at least a day or two and are even tastier (in our opinion) after they have rested for a few hours. So because they are time-consuming and keep well I usually make a bunch of them in advance and we eat the leftovers on the next day. Also, recipes like these taste better if you make them in bigger patches because the you will have more seared beef parts on the bottom of the roasting pan which makes for an even better sauce! If you want to make this recipe, you should plan for at least four hours – about one and a half hour for preparation and about two hours until they are tender (depending on the quality of the meat). The most time-consuming part is cutting up all the ingredients and then rolling the stuff up. But it is so worth it! I love beef roulades and the time it takes to make them is what made them a rare feast when I was a kid. But enough with the talking and let’s start with the recipe! For this recipe you will need 6-10 thin slices of good quality beef for cooking (like thick flank, etc.). Every family uses different ingredients for the roulades, but in our case you will. 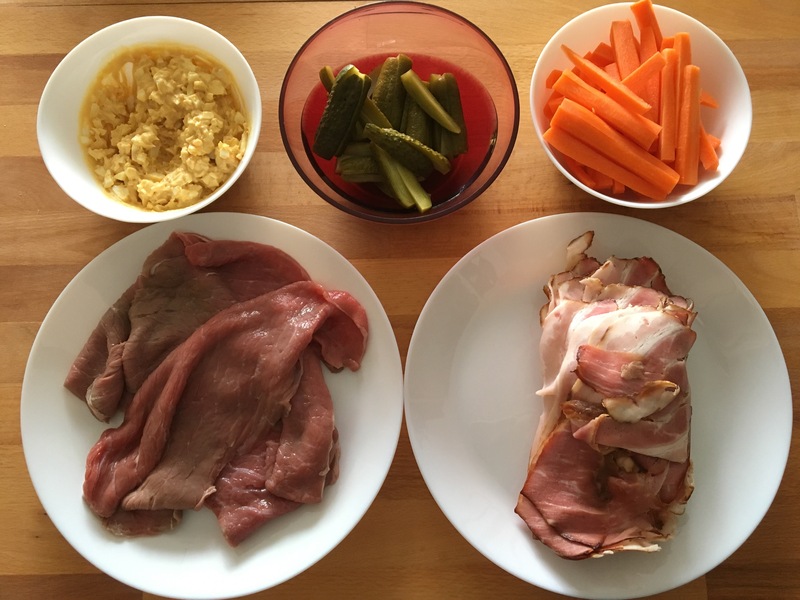 need mustard, 1-2 boiled eggs, thinly sliced bacon, pickles (we use sweet-sour pickles), carrots, onions, salt and pepper. You will also need a big pot in which you can fit all of the roulades, the onions as well as some water. First, you need to prepare all the ingredients for the roulades. Trim the meat of any excess fat or parts that you don’t want. Mince the egg and mix it with about 1 – 1 1/2 Tbsp of mustard in a small bowl (if you are making more than 6 you will need to double the amount), set aside. Cut the carrots and pickles into about 7mm (about 1/4 inch) strips. Cut the bacon if it isn’t sliced already. Now comes the rolling. 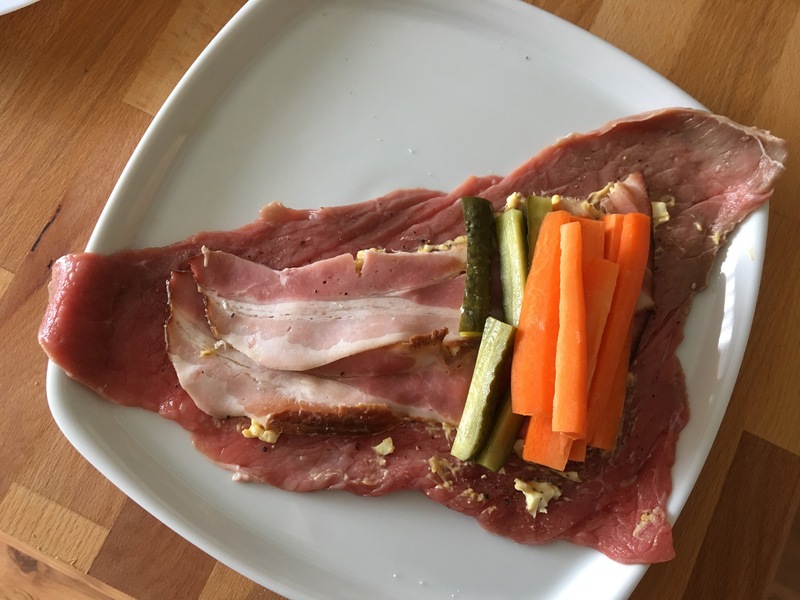 First, take a slice of meat, put salt an pepper on it, take a bit of the egg and mustard mixture and spread it onto the part of the meat slice that will have the filling on it (about 1/2 of the slice), Onto the spread, put two sliced of your bacon. At one end of the beef slice add about 4-5 carrot and pickle sticks. At this point you may add whichever veggies you want. If I have leftover zucchini or green onions I might add them too (but I didn’t have them on hand this time). Just be careful not to overstuff it. The slice should look somewhat like this after you have added all the filling. Also, be careful to leave some space for folding in the edges. Flap the edges of the beef slice over the veggies and roll it up so that all sides are closed and you cannot see the filling. Secure the edges with small metal cooking skewers or wooden (unflavored – I once had mint ones and it did not fare well) toothpicks. Carefully brush the outside of the roulade with a bit more mustard (just a bit to bring out more flavor while roasting) and sprinkle it with salt and pepper. Repeat this with all the beef slices, set everything aside on a plate. 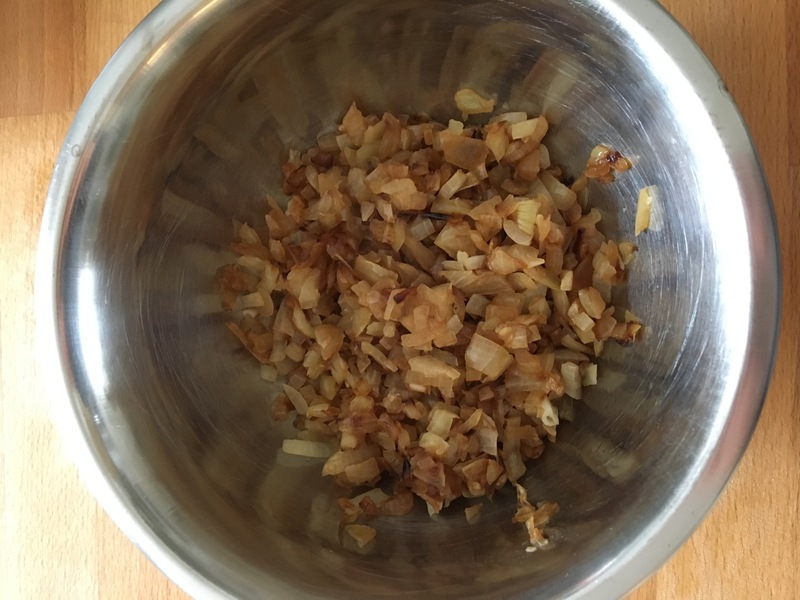 Cut the onions and fry them with the oil of your choice (I used olive oil) in your pot until they are golden brown. Remove them from the pot and set them aside. Add a bit more oil to your pot, turn the heat to high and put in the roulades. Try to roast them on all sides – just a few seconds until they are browning and leave their yummy roasted goodness on the bottom of the pan. Remove them from the pot and put them on a plate. Now put a little bit of water into your pot and scrape off all the roasted goodness from the bottom of your pot. This will make for a delicious sauce. Add the onions back in and atop of them the roulades (don’t forget to add all the juices that my have accumulated on the roulade plate). Add some more water, the roulades don’t have to be covered, about halfway up the roulades will be fine. Put on the lid, turn the heat to medium low and let them simmer for about 1 1/2 to two hours (turn them once in a while). The roulades are done when you can cut through them very easily (ours are so tender that you could cut them with a fork). The last step is to once again remove them from the pan and put them on a plate to finish the sauce. In our family we do not add much and do not thicken the sauce. Because these roulades are filled with mustard, salt, pepper and veggies, the sauce is quite flavorful. You can add a bit of sour cream and flour if you want to give it a hint of sourness and want to have the sauce on the thicker side. You may also puree the onions to thicken the sauce. Whatever suits your taste. Put the roulades back into the sauce and serve. We usually have some kind of pasta or rice to go with them as well as a big bowl of fresh salad. Some folks even have them with cooked potatoes or polenta. So feel free to add whatever you like! I hope you have fun trying these out and enjoy them with your loved ones.